Talis Aspire is an online resource list management system where lecturers can create reading lists using simple drag and drop tools. Library linking, acquisitions alerting and resource location functions make it easy for learners to connect with the library and find what they want. It allows Library staff to review lists, acquire materials to resource these lists, and ensure that materials are accurately described and discoverable. Reading Lists Online now includes a digitised content module. You can upload pdfs of scanned material through your lists when in edit mode and the system carries out a series of checks to ensure they are copyright compliant. You can also upload and verify compliance independently of Reading Lists Online at http://content.talisaspire.com/ . The starting point for accessing Talis Aspire is via the Library list link: http://lists.library.qmul.ac.uk. 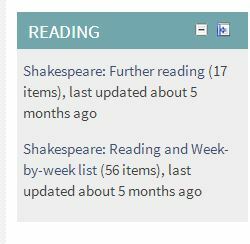 In this example from the School of English & Drama two lists have been integrated into the QMplus ‘Reading’ block. One of the great things about using Talis Aspire is that it can integrate directly into your QMplus course area. This integration occurs if there is a one-to-one match between the module or course you teach on and the module code as registered in the Central records system (SITS). Once a reading lists has been created for your module just add the ‘Reading’ block from the blocks menu. This will give your students a direct link to the reading list you have created.